An official investigation has found a passenger plane taking off from Gatwick airport was involved in a possible "near miss" with another aircraft. Investigators say what happened back on April the 25th around 1714 in the afternoon was caused by an air traffic controller at Swanwick not scanning his radar display properly. The time between take off's was reduced from two minutes to 45 secs which was also noted as a factor. but the UK Airprox Board report say the controller and pilots took hold of the situation so any collision was unlikely. 2016. Both pilots were under IFR, in receipt of a Radar Control Service from Swanwick. 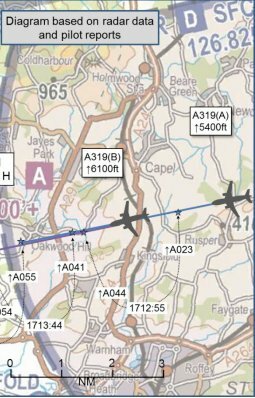 A319(A) closed on A319(B) and was given avoiding action by ATC. Minimum separation was recorded as 700ft vertically and 1.9nm horizontally. The Board assessed that timely and effective actions had nonetheless been taken by the controller; additionally, the rate of catch-up between the two aircraft was very low and the pilot of A319(A) had been aware of the presence of A319(B) ahead so would not have continued on a collision path as a result.